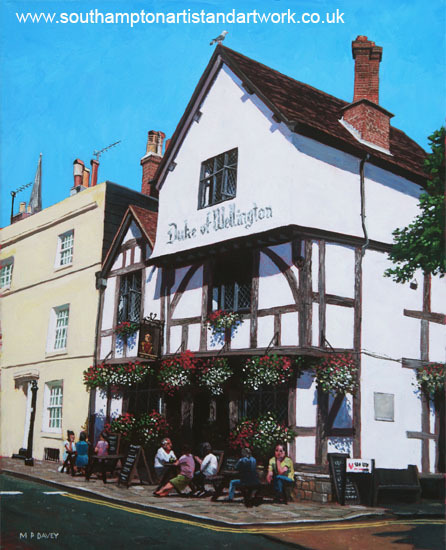 This acrylic painting depicts a famous Tudor public house within the historic City of Southampton, UK. This old building was built upon Norman cellars during 1220. It became a pub in 1494. In 1815 the pub was renamed, from the Shipwrights Arms, to the Duke of Wellington, after the victory of the Battle of Waterloo in that year. The pub can be seen at 36 Bugle St, SO14 2AH . I feel that acrylic painting techniques work well with man made subjects, because of the technical aspects of painting straight lines, perspective, and the mechanical processes that can be achieved with the quick drying nature of the paint. Painting scenes like this in oil paint can be done, but it requires a lot more time and possibly not so effective. In this case the entire composition is one made up of the challenges of perspective, and capturing a subject that is mechanically based. The day is a sunny one and the bold, blue sky helps to emphasize the clean and large areas of white, separated by dark wood beams, that typifies buildings of the Tudor period. The collection of people enjoying a drink at the bar help to give the painting life and scale, and show the true use that the Duke of Wellington pub offers the public. A seagull is seen perched on the roof, enjoying the sun. Painted on a canvas measuring 16" x 20", during 2012.